I am grateful for those who challenge and stretch my thinking. Often, a metaphor or simile, posed by another, helps me to consider the core and the edges of an issue. To compare “this” to “that,” if not overly done, helps me to understand a thing better. This morning, I finally made time to read the recommendation from John. Now, my mind is pleasantly tumbling (like a dryer, not a fall) about how education may be in a similar state to newspapers. I wonder about the similarities, the differences, the not-worth-comparings. All of this seems to offer the grandmotherly option between Starkman and the FON crew — “You’re both right, dear. We need institutions and we need experiments.” Even given this hybridization, though, our views diverge: Plan A assumes that experiments should be spokes to the newspapers’ hub, their continued role as the clear center of public interest journalism assured, and on the terms previously negotiated. Plan B follows Jonathan Stray’s observations about the digital public sphere: in a world where Wikipedia is a more popular source of information than any newspaper, maybe we won’t have a clear center anymore. Maybe we’ll just have lots of overlapping, partial, competitive, cooperative attempts to arm the public to deal with the world we live in. 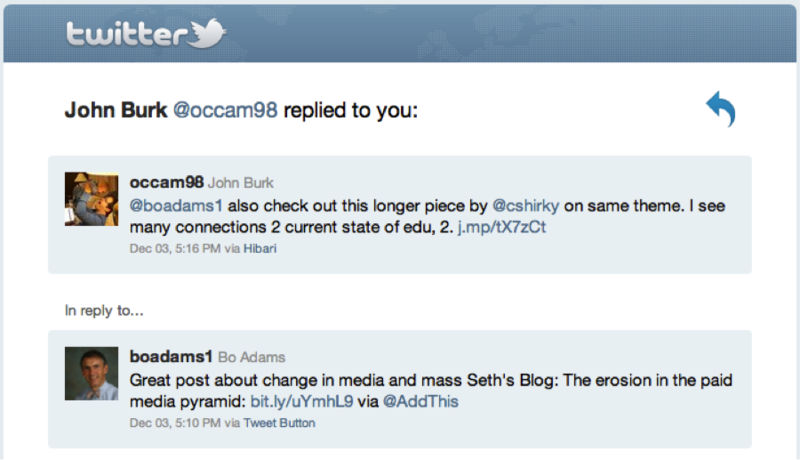 This entry was posted in Random Reflections and tagged change, innovation, newspaper, twitter by boadams1. Bookmark the permalink.